Warwick shutters combine traditional cabinet making techniques with the latest innovation. Full height shutters in Extra White from the Warwick range. This simple freestanding kitchen is set against beautiful full height shutters. The smooth shutters contrast beautifully with the rough-hewn floorboards, while simple decoration sets off the whole look. This stylish living room shows just how gorgeous our fan shutters can look. Crisp white shutters are timeless, and the stunning arched shutters show off these gorgeous feature windows to their best advantage. Tier-on-tier shutters in Creamy from the Warwick range. Neutral shades never go out of style, and these cream shutters are no exception. They look simply stunning against this statement love seat. The tier-on-tier setup makes them endlessly versatile – tilt individual panels to tailor your light and privacy levels. In our latest article, we take an in-depth look at these popular window coverings and guide you through the options. 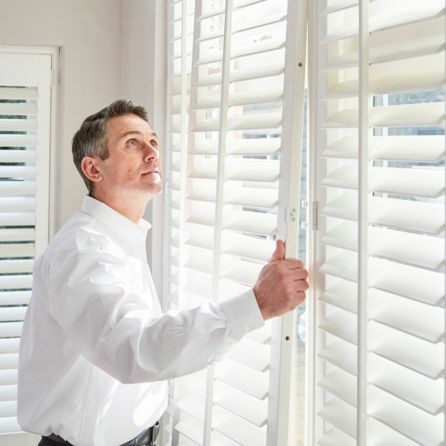 - What are window shutters? Read our comprehensive guide to find the most suitable blind for your bathroom. 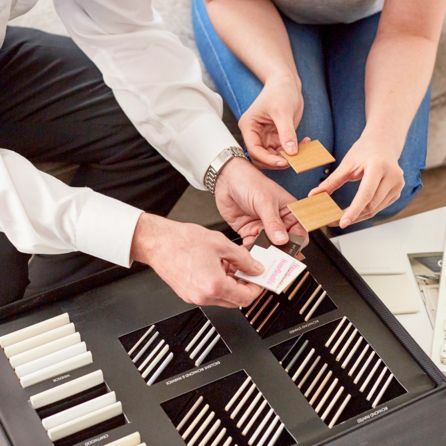 The Warwick range includes 25 colour options – including 10 exclusive shades – so you will be sure to find the perfect tone to complement your chosen design scheme. We offer the highest quality shutters, superbly constructed in eye-catching styles and beautiful designs. Each shutter we make is bespoke to the customer’s requirements. Of course they’re made-to-measure but there is also the finish and louvre width, hinge colour and style of tilt rod to choose.